Practices will be on Tuesdays and Thursdays from 4-5:30 p.m. at City Park beginning January 15th. Not only did the team win, but Mount Carmel was the only team to play in the finals! Our line 1 and line 2 doubles teams played each other in the finals and our line 1 and line 2 singles players competed in the finals. Taylor Garcia finished the tournament with 1st place in singles. Julia Kapusta finished the tournament with 2nd place in singles after an amazing match defeating Dominican in the semis! Caroline Arnold and Niki Bountovinas finished the tournament with 1st place in doubles. Katie Brennan and Casey Pappas finished the tournament with 2nd place in doubles. The team will travel to Monroe to compete in the state tournament 4/22-4/24! Wish them luck! Go cubs! Mount Carmel won all 5 lines against McGehee! Julia Kapusta played an excellent match at line 1 singles, winning 6-0, 6-0. Brenna Bell had some long points at line 2 singles and she won 6-3, 7-5! 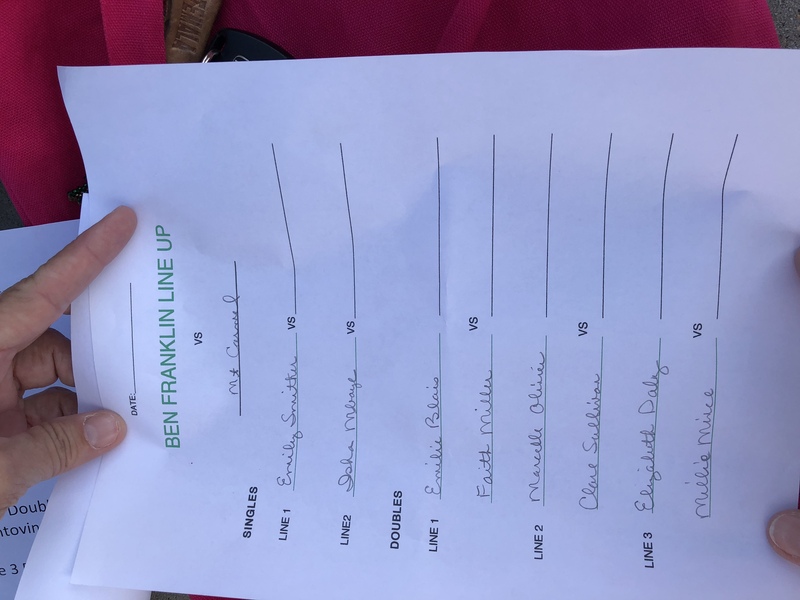 Caroline Arnold and Niki Bountovinas won line one singles followed by Katie Brennan and Casey Pappas at line two and Bailey Danflous and Bailey Schexnaildre at line 3. Niki and Caroline hit several winners that can only be described as phenomenal! Casey's great serves set Katie up for some great put-aways at the net! Bailey and Bailey had great communication and movement on the court! Great win for the Cubs! Mount Carmel placed 7th in the A bracket of the tournament. Go cubs! The team played 2 other teams per day with many of the girls playing a total of 4 matches each day. Each girl fought through every match, never giving up, and the team had some great wins!! Mount Carmel won 3-2! All of the girls played great and had fabulous matches! Julia Kapusta at line 1 singles and Casey Pappas at line 2 singles played tough matches and stayed strong throughout! Taylor Garcia and Katie Brennan at line 1 doubles and Niki Bountovinas and Caroline Arnold at line 2 doubles ended their matches with a win! Bailey Danflous and Brenna Bell at line 3 doubles had a close match with some long points. MCA lost 2-3 to a great team! MCA started off the official season winning all five lines against Ursuline! GO CUBS! Julia Kapusta, with her great movement and sneaky shots, won 6-1, 6-0 at line 1 singles. Bailey Schexnaildre, with her great put away returns and net play, won 6-1, 6-3 at line 2 singles. Caroline Arnold and Niki Bountovinas exemplified teamwork and communication to win 6-2, 6-0 at line 1 doubles. Katie Brennan and Casey Pappas showed focus and determination to win 6-0, 6-2 at line 2 doubles. Bailey Danflous and Brenna Bell complimented each other as they worked together in a tough match to win 6-4, 6-3 at line 3 doubles. The tennis team will scrimmage against St. Joseph's Academy on Wednesday, February 21 at City Park. The first match of the season is Monday, February 26 at 4 PM at City Park. Congratulations to Taylor Garcia who signed to play with Washington & Lee next year! We are proud of you! The team traveled to Monroe, LA to compete in the state tournament 4/26-4/28. Julia Kapusta defeated a singles player from Lafayette and was defeated by a girl from St. Joseph's who went on to be a finalist. Taylor Garcia : Division I, Singles Champion! Wins 5 matches, defeating a player from Hammond, a player from Baton Rouge, a player from West Monroe, and two players from St. Joseph's. Gabi DePascual and Niki Bountovinas: Divison 1, Semifinalists! Wins 3 matches defeating a team from Parkway, a team from St. Joseph's, and a team from Byrd. Katie Brennan and Casey Pappas competed against a tough team from Baton Rouge. 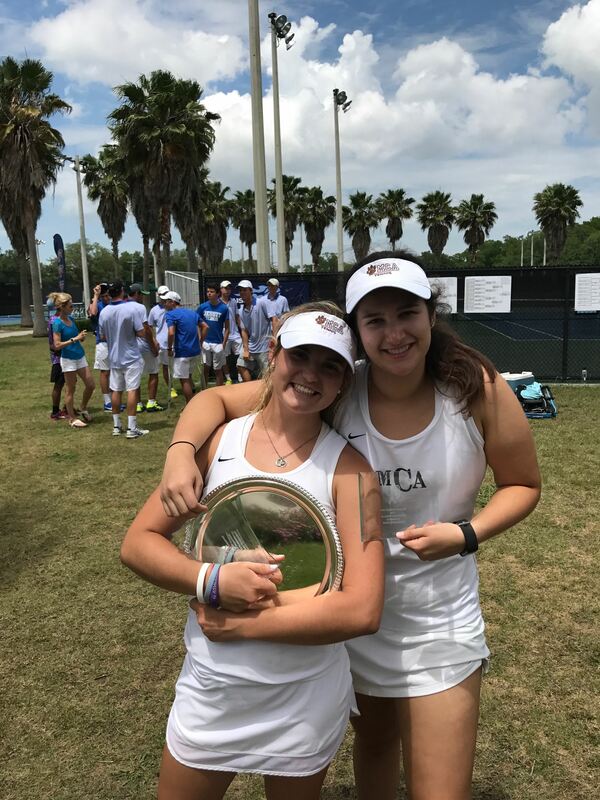 Mount Carmel Academy placed 3rd overall in the state tournament, defeating several teams who had an advantage with 2 more players at the tournament. Opposed to the teams with 3 doubles and 2 singles lines, MCA brought 2 doubles lines and 2 singles lines. However, our girls fought hard and played great, leading us to 3rd place. Mount Carmel Academy is awarded for coming in 2nd place in the Regional Tournament! Taylor Garcia won in the finals of the Singles Bracket! She is the 2017 singles champion! Julia Kapusta made it to the semi-finals in the singles bracket! Gabi DePascual and Niki Bountovinas made it to the semi-finals of the tournament in the doubles bracket! Casey Pappas and Katie Brennan made it to the quarter-finals in the doubles bracket! Grace Heidingsfelder and Bailey Danflous had a great match against DHS. The match v. Chapelle on Monday, 3/10 was also the Senior match which recognized our seniors who participated in their final regular season match at Mount Carmel. Cleo Pappas, the team manager and former team member, was recognized as a Senior team member. Also, Gabi DePascual and Sierra Grass were able to play together at line one and both were recognized as seniors for their dedication to the team. The three seniors were given balloons, cards, gifts, and flowers from their teammates. The team members really spent time planning the day to honor the girls. The cubs beat Chapelle in all three singles matches! Gabi DePascual and Sierra Grass played together at line one, Bailey Danflous and Casey Pappas played together at line two and Kate Heidingsfelder and Grace Heidingsfelder played line three. All three teams did a fabulous job! The cubs lost to Dominican after some close matches! The girls fought hard and hit some amazing shots! Thanks to everyone who came out to support the team. Taylor Garcia and Kate Heidingsfelder win line one doubles! Kate hit some great, deep, cross-court shots, setting Taylor up perfectly for a put away! Niki Bountrovinas and Casey Pappas win line two doubles! Niki hit some powerful serves and Casey hit some great returns! Gabi DePascual and Grace Heidingsfelder win line 3 doubles! Grace was all over the court, covering the open area and returning difficult shots! Gabi hit some great put aways at net and some great serves! Katie Brennan fought hard at the number one singles spot. The match was too close for comfort! They girls were very evenly matched and Katie played wonderfully! She hit some fabulous shots and played smart! Bailey Danflous had a tough match at line two singles, but she overcame the struggle for the win! She won the first set. She barely lost in a tiebreaker for the second set win. She won the third set tiebreaker after some very competitive points! MCA Wins again, putting our record at 5-0!!! Julia Kapusta played number one singles and Grace Heidingsfelder played number two singles. Gabi DePascual and Niki Bountrovinas won number one singles 6-0, 6-3. Katie Brennan and Casey Pappas won number two doubles 6-1, 6-1. Kate Heidingsfelder and Sierra Grass won number three doubles 6-3, 6-1. MCA wins, putting our record at 4-0! Taylor Garcia wins number one singles. Julia Kapusta fights to win the close number two singles match! Gabi DePascual and Niki Bountrovinas lose in a 3rd set tiebreaker. Close match! Katie Brennan and Casey Pappas win after a close match for line two doubles. Sierra Grass and Grace Heidingsfelder go head to head almost every game in their match. They barely lose the first set, and lose the second set in a tiebreaker. Great match! MCA wins all matches against St. Martins, putting the cubs at a 3-0 record! Katie Bailey and Casey Pappas won line 1 doubles 6-0, 6-0. Katie hit some great down the line shots! Casey threw in some slices and short balls, mixing it up. They played great together! Kate Heidingsfelder and Grace Heidingsfelder won line 2 doubles 6-0, 6-0. Grace played the net like a pro! Kate had some great shots from the baseline. Their teamwork made the match fun and rewarding! Sierra Grass won line 1 singles 6-2, 6-2. She changed up her strategy throughout the match to stay on top! Julia Kapusta won line 2 singles 6-0, 6-0, moving all around the court and placing the ball perfectly to guarantee the win! The Cubs win all 5 lines against Ben Franklin putting the team at a record of 2-0 for the season! Taylor Garcia and Julia Kapusta had great singles matches. The doubles players: Gabi DePascual, Katie Brennan, Niki Bountrovinas, Casey Pappas, Sierra Grass, and Kate Heidingsfelder! The girls won all three doubles matches and one of the two singles matches v. Ursuline. Go Cubs! First win of the season! Doubles Players: Gabi DePascual, Niki Bountrovinas, Katie Brennan, Casey Pappas, Sierra Grass, and Grace Heidingsfelder! Our first local match will be Monday 2/20/2017 vs. Ursuline at City Park. The match begins at 4 PM. Come out and support your Cubs! Congratulations to the Cubs for coming in second place in the North bracket of the A Draw at the McGill-Toolen tournament! The tennis team will be traveling to Mobile to play in the McGill-Toolen tournament on February 17 and February 18. Updates and scores will be added to this page periodically. Check in and see how the Cubs are doing! Thursday, Feb 9th at 6 PM in the cafeteria. You will receive information regarding the season in general, practices, fees, and the upcoming tournament in Mobile. See you there! Congratulations to the 2016-2017 MCA tennis team! Tryouts will be held at City Park on Monday, January 9th AND Wednesday, January 11th. More information about tryouts will be given at the informational meeting in Room 1204 on January 4th.